Davis, John, ed., Wild Earth 4, no. 4 (Winter 1994/95). Republished by the Environment & Society Portal, Multimedia Library. http://www.environmentandsociety.org/node/5687. Butler, Tom, ed. Wild Earth: Wild Ideas for a World Out of Balance. Minneapolis: Milkweed Editions, 2002. Covill, Christopher J., "Greenpeace, Earth First! and The Earth Liberation Front: The Progression of the Radical Environmental Movement in America." University of Rhode Island Senior Honors Projects, Paper 93 (2008). 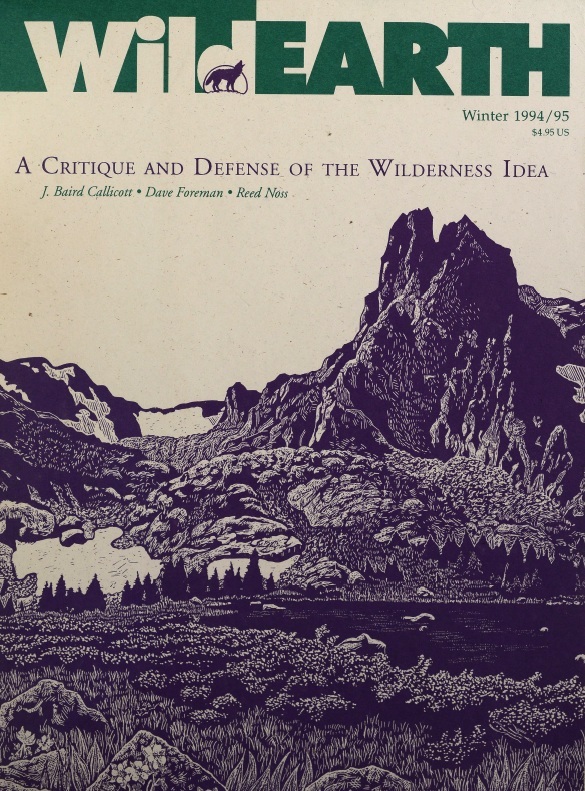 Keeling, Paul M. "Does the Idea of Wilderness Need a Defence?" Environmental Values 17, no. 4 (2008): 505–19. Callicott, J. Baird. "The Pragmatic Power and Promise of Theoretical Environmental Ethics: Forging a New Discourse." Environmental Values 11, no. 1 (2002): 3–25.